FOR CODES 1 THRU 9, LEAVE # OF PLAYERS AT 3 ON OPTIONS SCREEN. 1 Expert Level For those who have mastered the diffcult level of this game, have a real challenge with the Expert Level. At the title screen, use the "Trademark Konami Code" on control pad one: UP, UP, DOWN, DOWN, LEFT, RIGHT, LEFT, RIGHT, B, A, and START. You should then hear a quick chime if the code was entered correctly. The go into the options menu and cycle through, the Game Level Settings, and a new one should appear labeled EXPERT, To see the real full ending of the game, finish it on this level of difficulty. 1 Expert Level and 9 Lives Go to the Options screen and set BGM to 5 and Sound FX to 73. 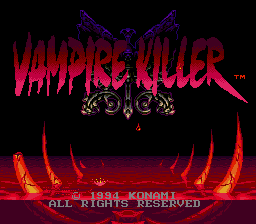 Press START and wait for the title screen to appear. Then press on control pad one: UP, UP, DOWN, DOWN, LEFT, RIGHT, LEFT, RIGHT, B, A, and START. You should then hear a quick chime if the code was entered correctly. The go into the options menu and cycle through the Game Level Settings, and a new one should appear labeled EXPERT. You can also choose up to 9 lives. To see the real full ending of the game, finish it on this level of difficulty. and will sometimes cause the game to crash. 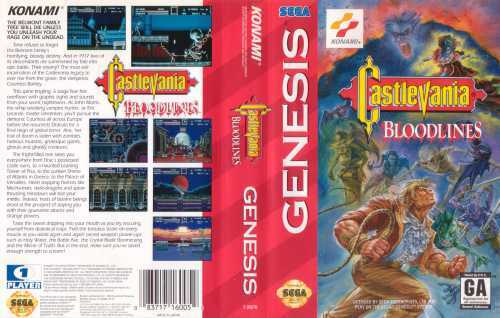 Bloodlines was an answered prayer from Konami/Castlevania fans that wanted to see a Castlevania game make it to the genesis. My favorite character is Eric, his weapon is a nice break from the normal whip. They did a pretty good job with the bosses and Vlad himself. Dracula doesn't look a white faced fool like so many halloween depictions. There are also some nice raster effects used in the game. I'm not fond of the last stage however, with the shifting level. BTW In the first print of Bram Stoker's Dracula it was a Bowie knife that killed him, not a stake. Pretty fun game! A classic hit form nintendo now goes sega! what a great choice! Great grpahics!, and sound! While I agree for the most part with Hiryu and Darkwolf there are a few things that bug me about this game. The Music is awesome but there seems to be a lack of it. For instance there are actually only about 10 or so actual tracks in the game. I know there were several places where I heard the music repeat which I think shouldn't be. Also some of the backgrounds were dull in color. For instance I think the werewolf in the first level lacks some detail. But I give Props to Konami for leaving in the gruesome details!!! Also Hiryu said to watch for the difficulty but I actually found this game to be pretty easy. Everything has a pattern in it on all the levels which can easily be memorized. Also the game doesn't really get difficult until you play it on the more difficult levels. While Darkwolf doesn't care for the last few stages with the scewed graphics...I nearly fell outta my chair while playing it! 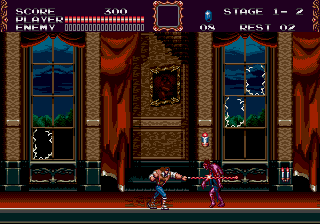 I actually thought it was one of the coolest effects I had seen beeing used on the Genesis. Also many of the boss enemies have neat Psuedo 3D appearances about them such as the nuts and bolts robot guy and the rotating Tower bit with the Dragon like boss. 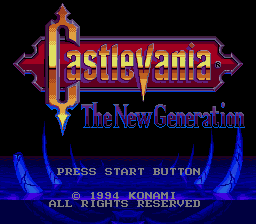 I must stress that no emulator yet can really hit the driving pulse of the sound that is in this game without having a real Genesis Model 1 to listen to it on. 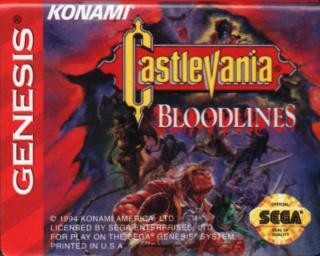 Not as complex or original as the other Castlevanias but the game was still good. The final boss was a bit over the top though.